That’s the problem with nose hair, unlike body hair, you can’t hide them under cloths, or easily shave them off, they require specialized intervention. It’s not uncommon for people to inflict eye watering pain on themselves to get rid of long, protruding nose hairs, by plucking them out with tweezers, or their fingers. Trimming them down with scissors is not a safe, or optimal solution, either. Thankfully, you don’t have to painfully rip hairs out or stick sharp scissors up your nose. There’s a smarter way to keep those pesky hairs pruned, and well-trimmed. Our research and review team have narrowed down their search to two top hair trimming tools built by leading experts in men’s hair removal – Panasonic and Philips – to offer you the best nose hair trimmers known to man (… and woman). These grooming tools are specifically designed to tackle unwanted nose, ear, and even bushy eyebrow hair growth. They’re the perfect solution to the seemingly unstoppable flow of embarrassing nose and ear hair, that left unattended, will run wild. You don’t need to be that guy with the crazy overgrown facial features resembling a Lama. 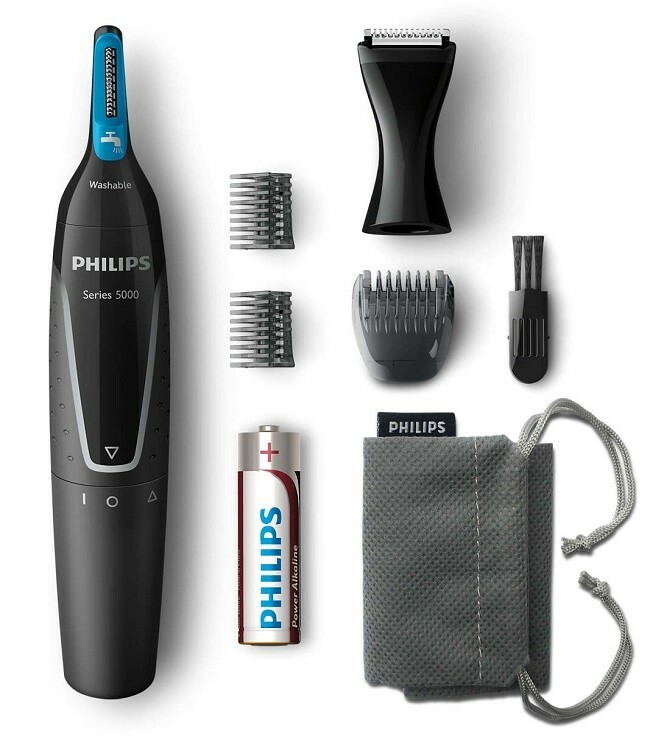 The Philips NT3160/10 (updated to NT5171/15) Nose Hair, Ear Hair and Eyebrow Trimmer Series 5000 is around 5 years newer than the popular Panasonic ER-GN30, and is our leading best trimmer choice overall. Let’s start by talking about the cutter – because that’s where the magic happens. 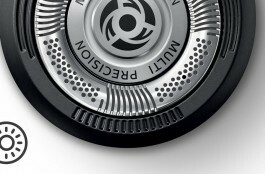 Located at the top of the trimmer is a unique thin foil cutting system with rounded edges to maintain skin comfort during hair trimming. Engineered for super precise cutting, slots capture and cut hairs with effortless speed and efficiency. It’s designed intelligently so that hairs can’t get caught between any moving components, because the last thing you want is a bunch of snagged hairs in the middle of a trimming session. 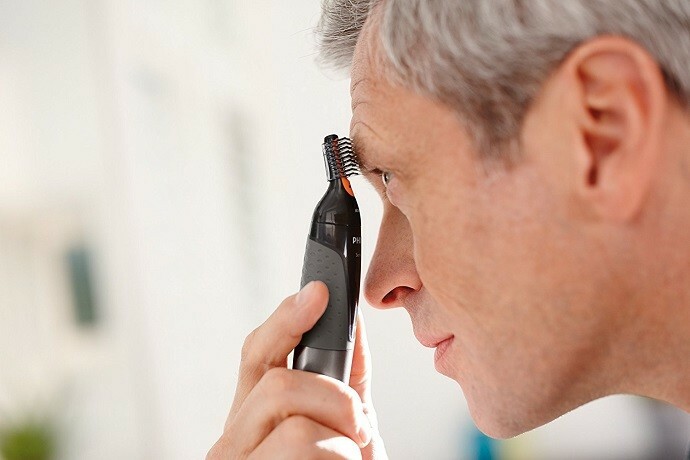 One of the main downsides that electric nose hair trimmers seem to have, is that, instead of cutting, the hairs get jammed in the machine and ripped from your nose. Obviously a very painful and inefficient way to tidy your nose hair, but an all too common problem with cheap, poor quality trimmers. 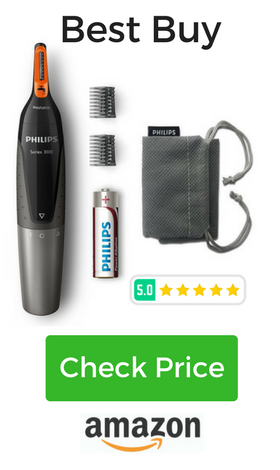 But the Philips Series 5000 NT5171/15 is not your ordinary trimmer – it’s a superior little grooming tool that’s leaving the competition for dead. Philips have called this “ProtecTube Technology” and they are backing its reliability with a “No Pulling Guarantee” – and judging from verified online reviews, it’s certainly living up to that promise. The cutting head of the trimmer is specifically angled to easily cut hair inside – or protruding from – the nostrils and ear canals, without the risk of cuts, nicks, or plucks. The trimmer is small and light, measuring around 6 inches in length… and because of this compact design, it’s very easy to handle and work with. It has a comfortable handle with textured soft rubber grip, and is waterproof and fully washable. It’s watertight seal works well enough that in can be used in the shower, placed under running water, or immersed in shallow water – but it probably won’t work if you’re visiting the Titanic. It’s cordless design and the high-performance motor runs on just a single AA battery that’s included in the box. A simply clockwise turn of the handle activates the trimmer. It comes with two eyebrow guards for trimming down and shaping overgrown eyebrows. One guard for “Short” and the other for “long” lengths – they simply slip over and click onto the trimmer head, giving you control over how short you want to trim your eyebrows. You’ll also get a protective cap to keep the cutter clean and protected, and pouch with drawstrings for travel and general storage. It’s a very easy to use, highly effective modern trimmer, ideal for travel or regular use at home. It’s fairly cheap to buy, with a retail value under £20, making it very affordable. But do not mistake the low price for low quality, because this is an outstanding quality nose trimmer. It’s true that you can buy a similar trimmer for less, but be warned, you do so at the risk of wasting money on a tool that’s not even half as good as this one right here. Avoid the temptation to buy an inferior cheap copy. High quality trimming tool for use on eyebrows, nose, ear, and facial hair with unique angle design. Sharp blades and patented “ProtecTube” ensure comfortable cutting without plucks or irritation. Waterproof design makes cleaning easy under running tap. No oiling required, meaning minimal maintenance other than cleaning and infrequent battery changes. Built to last with 2-year worldwide guarantee. Is this Philips Series 3000 / 5000 trimmer suitable for women? It’s geared towards men, but there’s no reason it can’t be used by both genders, this should be a suitable nose trimmer for ladies, too. The Panasonic ER-GN30 has been around since 2010 and has proven itself to be a reliable and efficient trimmer. At the time of writing, this trimmer has over 1,000 positive customer reviews on Amazon, which really speak volumes about its reliability and performance, and how this product has stood the test of time. Very easy to use and suitable for multiple small hair removal or detailing tasks. Hygienic washable design with “vortex” system to wash out all remaining cut hairs, without removing any parts or need for cleaning brush. Double edged cutting blades tackles stray hairs without tugs. Panasonic also have a vacuum version of this trimmer – the ER430K Ear & Nose Trimmer with Vacuum Cleaning System – much like a vacuum beard trimmer, it “hoovers” up cut hairs as you trim. By vacuuming the hairs away into a chamber that can be emptied later, you have less chance of inhaling, or making a mess of the sink with cut hairs. Panasonic also have a vacuum version of this trimmer – the ER430K Ear & Nose Trimmer with Vacuum Cleaning System – much like a vacuum beard trimmer, it “hoovers” up cut hairs as you trim. By vacuuming the hairs away into a chamber that can be emptied later, you have less chance of inhaling, or making a mess of the sink with cut hairs. Though, you should expect to pay an extra £10 or so for this vacuum feature. We had to give this Remington nose and ear trimmer a mention, because it’s worth buying, and here’s why. 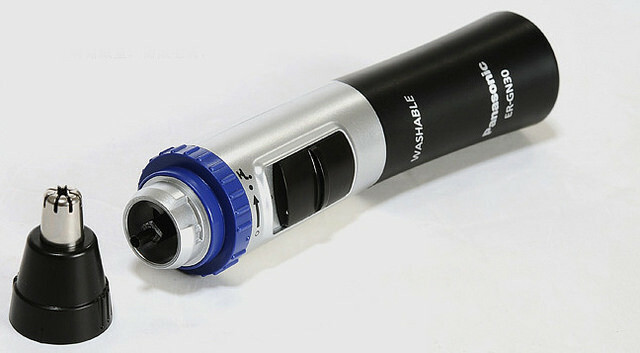 Has both Rotary and Trimmer interchangeable heads. Showerproof design – use in or out the shower. Length combs for eyebrow trimming. Multi grooming – nose, ears, eyebrows – fine trim moustache, beard, sideburns. Antibacterial, silver Nano coated blades for sterile precision trimming. 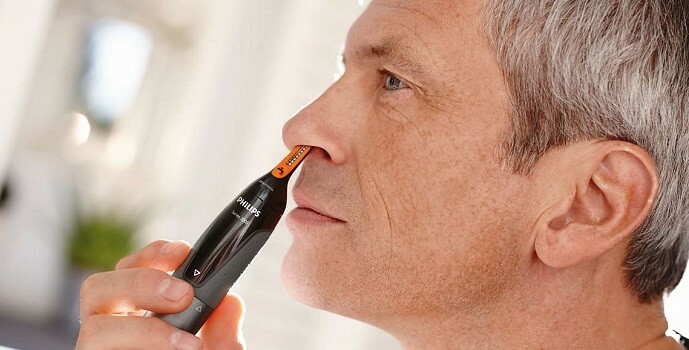 What Makes a Great Nose and Ear Hair Trimmer? Ok, you’ve had a look at our impressive bunch of nose trimmers, but out of the 13 we reviewed, only these 3 made the cut. It’s not that these are the be-all-end-all of nose and ear trimmers, – there’s plenty that work very well – it’s just that they fitted best with our criteria set out below. The nose hair trimmer should be manufactured by a reputable haircare and beauty brand. 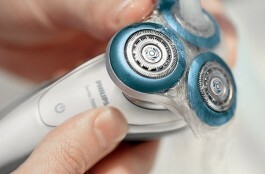 Names like Braun, Philips, Remington and Panasonic reign supreme in the men’s and woman’s hair and shaving market. Nothing against other brands, but always try do go with the specialists. Most electric trimmers for nose and ear hair are powered with disposable batteries. It’s rare to find a rechargeable, or corded model. This is a good thing, because a battery-operated trimmer gives you the ability to control the quality of the power supply. You don’t want a cheap built-in rechargeable battery that’s prone to quick draining, or mains power cord. By having the freedom to choose a quality battery like Energizer or Duracell your trimmer will have a long usage time and consistent power output. A Which Study found there to be a 2 hour+ difference in power output between cheap and higher rated batteries. Good manually operated trimmers are available, but they are slow and somewhat cumbersome to use. Disposable battery power is the best mode of power for this kind of device. A solid, sturdy construction built with good materials is a must if you want your trimmer to maintain results and last years. Mobility and ease of use is another important consideration. Excessive nose and ear hair growth can strike at any time during adulthood. Though it’s mostly guys that develop this unfortunate problem, women aren’t immune, and you don’t need to be an old age pensioner. If you’re nose hairs need clipped, then it’s likely your ears and maybe even your eyebrows need attention, too. The trimmer you buy should have the accessories and versatility to remove nose, eyebrow and ear hair – not limited to one. Only nose trimmers with a large majority of positive verified purchase reviews make the cut. It’s all well and good to read what the manufacturer has to say on the box, online, or on advertising and promotional material. But the real life feedback should come from reviews of customer using the product regularly. This will provide a true representation on how the product is working. It was my barber that first noticed my sprouting ear hair and named it “the badge of maturity”, but I call it unsightly, and one step closer to retirement. I don’t know what’s worse, overgrown nose hair, or ear hair. But what I do know is that the right trimming tool can comfortably remove these hairs. I thought going bald in my late 20’s was the worst possible thing that could happen to me, but I’ve embraced the shaven head look and actually quite like it now. I’ve got my own set of great hair clippers and save a fortune on haircuts every couple of weeks. But I soon developed a new hair related problem that negatively affected my appearance and self-confidence, one that required immediate attention. I started growing noticeable hairs from both my ears and nose – not the most flattering of facial attributes for a young man. It’s a strange situation you face as you reach the later years of aging. You start shedding hair from your head (if you’re genetically predisposed to male pattern baldness) and grow it on other unwanted parts of your body. Now, nasal hair does serve an important purpose in the human body. It serves to filter foreign particles and pollutants from the air we breathe. A study found that increased nasal hair density can reduce the development of asthma, an inflammatory disease of the airways. Of course, some nasal hair is important for our health, but nobody wants thick hair sprouting from their nostrils. Excessive overgrowth of nasal hair must be dealt with, and I’ll show you the best way to go about doing that in just a minute. 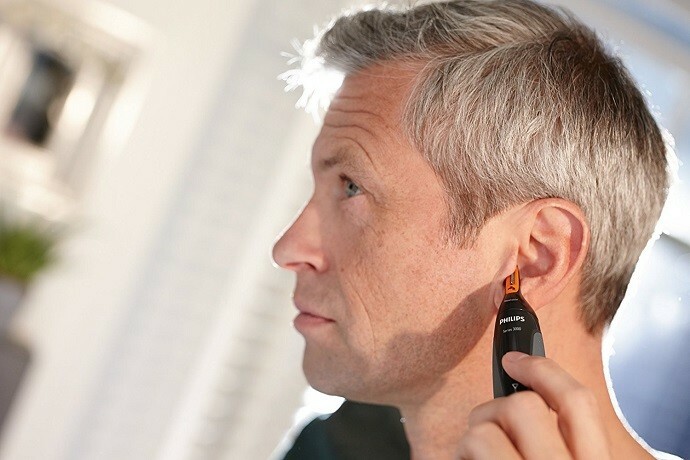 Although medical research on ear hair is limited, it’s believed that it also serves as a filtering protection, and like nasal hair, older men (and women) can experience excessive growth at the entrance of the ear canal. So, here’s how to clear that excessive hair growth, painlessly. Pick up your electric trimmer in one hand. Push your nose up slightly with your other hand – like making a funny “pigs nose” – this will expose more hairs and making it easier to see what you’re doing. Switch the trimmer on and insert cutter into nostril. More the trimmer around slowly, in a circular patter – you should hear the hairs getting cut. Blow your nose to clean cut hairs. 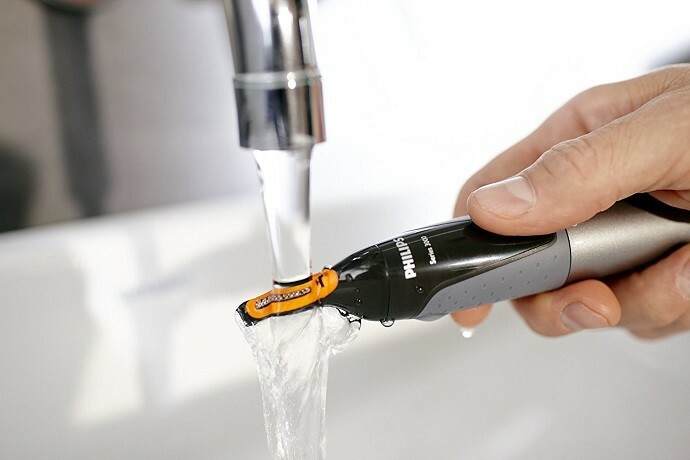 Give your trimmer a good clean under running water. How Often Should you Trim your Nose Hairs? It really depends on the rate and density at which your hair grows back, everyone is slightly different. You’ll be looking to trim down hairs every 1 or 2 weeks, or whenever they become very visible around the nostrils. It’s really a personal choice. Either way, its important to have the right nose and ear trimmer to hand when the time calls. What’s The Quietest Electric Shaver?